The use of immunomodulatory cytokines has been shown effective in regressing a wide range of tumors. However, systemic delivery of recombinant cytokines results in serious, potentially life-threatening, adverse effects. By contrast, nucleic acid transfer via electroporation (EP) is a safe and effective method of delivering plasmid-encoded cytokines to tumors. Intratumoral delivery of IL-12 plasmid DNA by electroporation (IT-pIL12-EP) produced objective response rates in Phase 2 clinical trials in metastatic melanoma. However, only 17.9% of patients receiving IT-pIL12-EP show a complete therapeutic response. Here, we sought to improve the antitumor efficacy of our clinical IT-pIL12-EP plasmid electroporation platform. 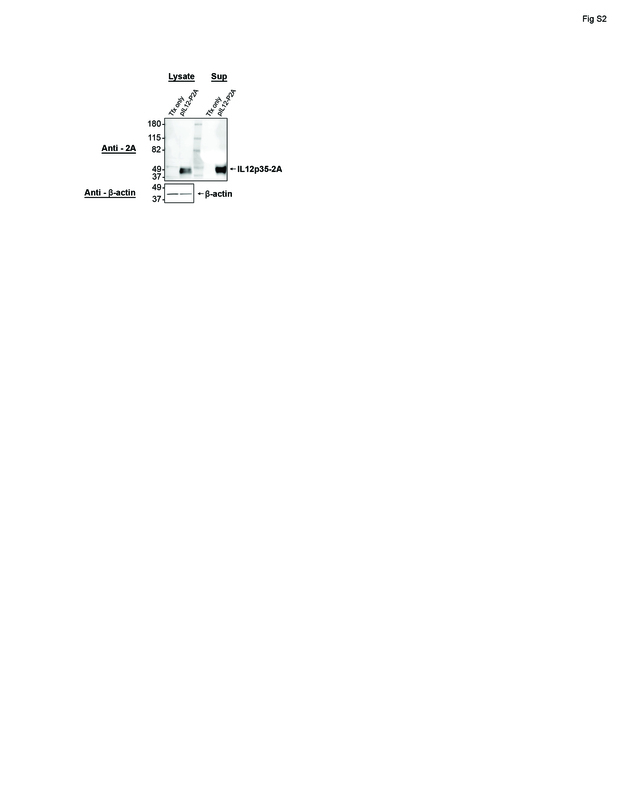 We evaluated multiple plasmid designs for IL-12 expression. IL-12 expression from a plasmid incorporating a picornavirus-derived co-translational P2A site was the most effective in expressing IL-12p70. In addition, modifying the electroporation parameters improved transfection efficiency and expression of plasmid-derived IL-12p70, as well as its downstream effector IFN-γ in vivo. Finally, using a murine melanoma model that is representative of the intended target patient population, we show that combining modified electroporation conditions with the pIL12-P2A plasmid expression enhances the systemic antitumor response. These improvements to the IT-pIL12-EP platform may improve patient clinical response rates and survival when translated to clinical trials. Neumann E, Schaefer-Ridder M, Wang Y, Hofschneider PH. Gene transfer into mouse lyoma cells by electroporation in high electric fields. EMBO J. 1982;1:841–5. Yarmush ML, Golberg A, Sersa G, Kotnik T, Miklavcic D. Electroporation-based technologies for medicine: principles, applications, and challenges. Annu Rev Biomed Eng. 2014;16:295–320. Rosazza C, Meglic SH, Zumbusch A, Rols MP, Miklavcic D. Gene electrotransfer: a mechanistic perspective. Curr Gene Ther. 2016;16:98–129. Trinchieri G, Rengaraju M, D’Andrea A, Valiante NM, Kubin M, Aste M, et al. Producer cells of interleukin 12. Parasitol Today. 1993;9:97. Medzhitov R. Toll-like receptors and innate immunity. Nat Rev Immunol. 2001;1:135–45. Presky DH, Yang H, Minetti LJ, Chua AO, Nabavi N, Wu CY, et al. A functional interleukin 12 receptor complex is composed of two beta-type cytokine receptor subunits. Proc Natl Acad Sci USA. 1996;93:14002–7. Gately MK, Warrier RR, Honasoge S, Carvajal DM, Faherty DA, Connaughton SE, et al. Administration of recombinant IL-12 to normal mice enhances cytolytic lymphocyte activity and induces production of IFN-gamma in vivo. Int Immunol. 1994;6:157–67. Trinchieri G. Interleukin-12: a cytokine at the interface of inflammation and immunity. Adv Immunol. 1998;70:83–243. Brown TJ, Lioubin MN, Marquardt H. Purification and characterization of cytostatic lymphokines produced by activated human T lymphocytes. Synergistic antiproliferative activity of transforming growth factor beta 1, interferon-gamma, and oncostatin M for human melanoma cells. J Immunol. 1987;139:2977–83. Coughlin CM, Salhany KE, Gee MS, LaTemple DC, Kotenko S, Ma X, et al. Tumor cell responses to IFNgamma affect tumorigenicity and response to IL-12 therapy and antiangiogenesis. Immunity. 1998;9:25–34. Germann T, Gately MK, Schoenhaut DS, Lohoff M, Mattner F, Fischer S, et al. Interleukin-12/T cell stimulating factor, a cytokine with multiple effects on T helper type 1 (Th1) but not on Th2 cells. Eur J Immunol. 1993;23:1762–70. Bramson JL, Hitt M, Addison CL, Muller WJ, Gauldie J, Graham FL. Direct intratumoral injection of an adenovirus expressing interleukin-12 induces regression and long-lasting immunity that is associated with highly localized expression of interleukin-12. Hum Gene Ther. 1996;7:1995–2002. Shimizu T, Berhanu A, Redlinger RE,Jr., Watkins S, Lotze MT, Barksdale EM,Jr. 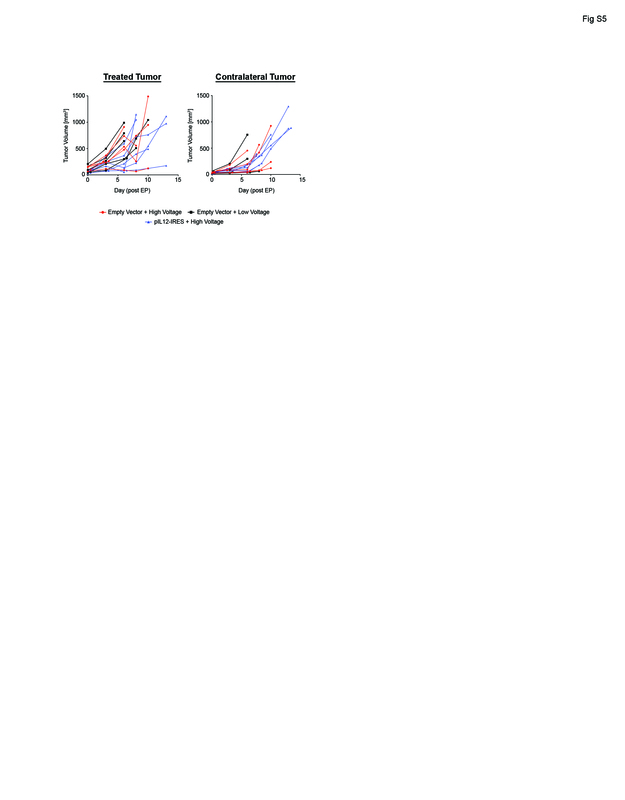 Interleukin-12 transduced dendritic cells induce regression of established murine neuroblastoma. J Pediatr Surg. 2001;36:1285–92. Heinzerling L, Dummer R, Pavlovic J, Schultz J, Burg G, Moelling K. Tumor regression of human and murine melanoma after intratumoral injection of IL-12-encoding plasmid DNA in mice. Exp Dermatol. 2002;11:232–40. Lucas ML, Heller L, Coppola D, Heller R. IL-12 plasmid delivery by in vivo electroporation for the successful treatment of established subcutaneous B16.F10 melanoma. Mol Ther. 2002;5:668–75. Lohr F, Lo DY, Zaharoff DA, Hu K, Zhang X, Li Y, et al. Effective tumor therapy with plasmid-encoded cytokines combined with in vivo electroporation. Cancer Res. 2001;61:3281–4. Heller L, Merkler K, Westover J, Cruz Y, Coppola D, Benson K, et al. Evaluation of toxicity following electrically mediated interleukin-12 gene delivery in a B16 mouse melanoma model. Clin Cancer Res. 2006;12:3177–83. Daud AI, DeConti RC, Andrews S, Urbas P, Riker AI, Sondak VK, et al. 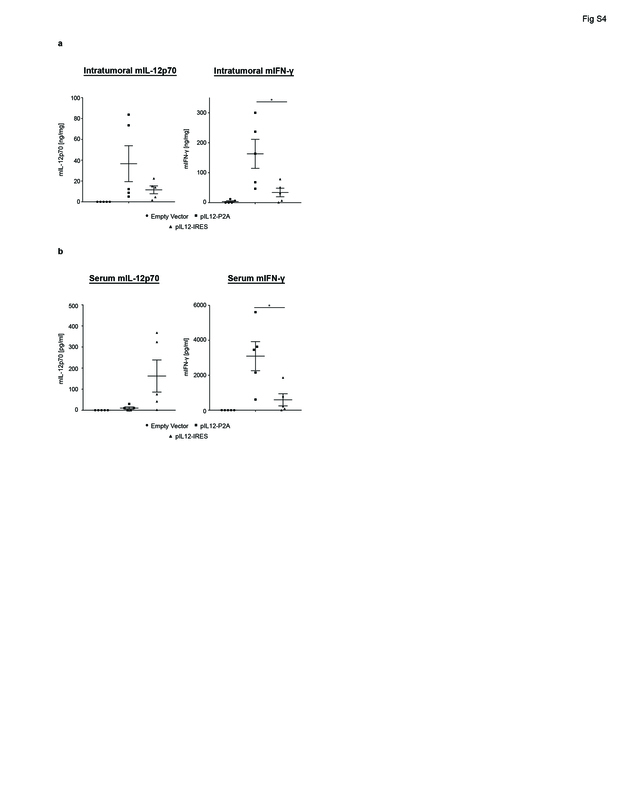 Phase I trial of interleukin-12 plasmid electroporation in patients with metastatic melanoma. J Clin Oncol. 2008;26:5896–903. Cha E, Daud A. Plasmid IL-12 electroporation in melanoma. Hum Vaccin Immunother. 2012;8:1734–8. Cohen J. IL-12 deaths: explanation and a puzzle. Science. 1995;270:908. Trinchieri G, Pflanz S, Kastelein RA. The IL-12 family of heterodimeric cytokines: new players in the regulation of T cell responses. Immunity. 2003;19:641–4. Harries M, Phillipps N, Anderson R, Prentice G, Collins M. Comparison of bicistronic retroviral vectors containing internal ribosome entry sites (IRES) using expression of human interleukin-12 (IL-12) as a readout. J Gene Med. 2000;2:243–9. Jiang C, Magee DM, Cox RA. Construction of a single-chain interleukin-12-expressing retroviral vector and its application in cytokine gene therapy against experimental coccidioidomycosis. Infect Immun. 1999;67:2996–3001. Lorenzo C, Perez-Chacon G, Garaulet G, Mallorquin Z, Zapata JM, Rodriguez A. Efficient expression of bioactive murine IL-12 as a self-processing P2A polypeptide driven by inflammation-regulated promoters in tumor cell lines. Cancer Gene Ther. 2015;22:542–51. Canton DA, Shirley S, Wright J, Connolly R, Burkart C, Mukhopadhyay A, et al. Melanoma treatment with intratumoral electroporation of tavokinogene telseplasmid (pIL-12, tavokinogene telseplasmid). Immunotherapy. 2017;9:1309–21. de Felipe P. Polycistronic viral vectors. Curr Gene Ther. 2002;2:355–78. Weaver JC, Smith KC, Esser AT, Son RS, Gowrishankar TR. A brief overview of electroporation pulse strength-duration space: a region where additional intracellular effects are expected. Bioelectrochemistry. 2012;87:236–43. Daud AI, Loo K, Pauli ML, Sanchez-Rodriguez R, Sandoval PM, Taravati K, et al. Tumor immune profiling predicts response to anti-PD-1 therapy in human melanoma. J Clin Invest. 2016;126:3447–52. Shindo G, Endo T, Onda M, Goto S, Miyamoto Y, Kaneko T. Is the CD4/CD8 ratio an effective indicator for clinical estimation of adoptive immunotherapy for cancer treatment? J Cancer Ther. 2013; 04:No.08: 9. Sin JI, Park JB, Lee IH, Park D, Choi YS, Choe J, et al. Intratumoral electroporation of IL-12 cDNA eradicates established melanomas by Trp2(180-188)-specific CD8+ CTLs in a perforin/granzyme-mediated and IFN-gamma-dependent manner: application of Trp2(180-188) peptides. Cancer Immunol Immunother. 2012;61:1671–82. Pierce RH, Campbell JS, Pai SI, Brody JD, Kohrt HE. In-situ tumor vaccination: bringing the fight to the tumor. Hum Vaccin Immunother. 2015;11:1901–9. Pestova TV, Kolupaeva VG, Lomakin IB, Pilipenko EV, Shatsky IN, Agol VI, et al. Molecular mechanisms of translation initiation in eukaryotes. Proc Natl Acad Sci USA. 2001;98:7029–36. Mizuguchi H, Xu Z, Ishii-Watabe A, Uchida E, Hayakawa T. IRES-dependent second gene expression is significantly lower than cap-dependent first gene expression in a bicistronic vector. Mol Ther. 2000;1:376–82. Shikama Y, Hu H, Ohno M, Matsuoka I, Shichishima T, Kimura J. Transcripts expressed using a bicistronic vector pIREShyg2 are sensitized to nonsense-mediated mRNA decay. BMC Mol Biol. 2010;11:42. Szymczak AL, Workman CJ, Wang Y, Vignali KM, Dilioglou S, Vanin EF, et al. Correction of multi-gene deficiency in vivo using a single ‘self-cleaving’ 2A peptide-based retroviral vector. Nat Biotechnol. 2004;22:589–94. Kuzmich AI, Vvedenskii AV, Kopantsev EP, Vinogradova TV. [Quantitative comparison of expression for genes linked in bicistronic vectors via ires or 2A-peptide of porcine teschovirus-1 sequence]. Bioorg Khim. 2013;39:454–65. Gillessen S, Carvajal D, Ling P, Podlaski FJ, Stremlo DL, Familletti PC, et al. 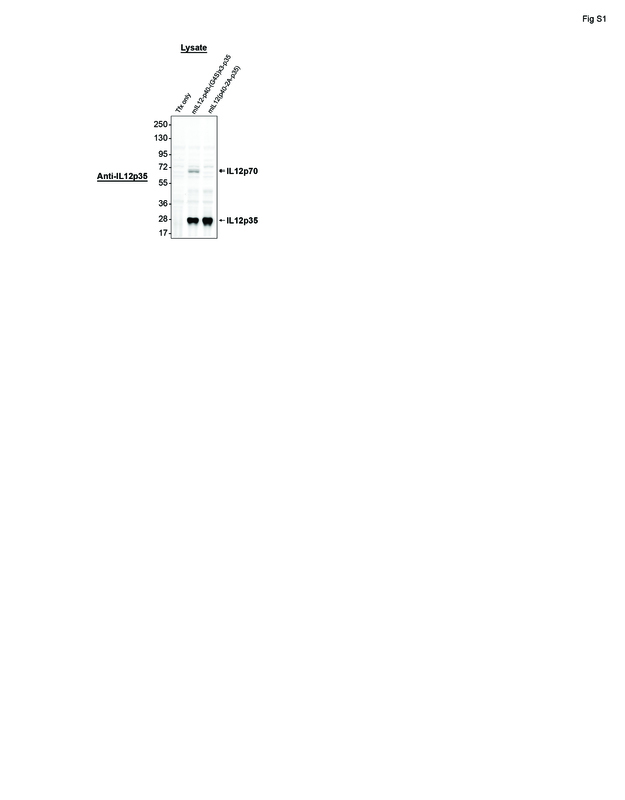 Mouse interleukin-12 (IL-12) p40 homodimer: a potent IL-12 antagonist. Eur J Immunol. 1995;25:200–6. Lucas ML, Heller R. IL-12 gene therapy using an electrically mediated nonviral approach reduces metastatic growth of melanoma. DNA Cell Biol. 2003;22:755–63. Horikoshi T, Naganuma H, Ohashi Y, Ueno T, Nukui H. Enhancing effect of electric stimulation on cytotoxicity of anticancer agents against rat and human glioma cells. Brain Res Bull. 2000;51:371–8. Ogihara M, Yamaguchi O. Potentiation of effects of anticancer agents by local electric pulses in murine bladder cancer. Urol Res. 2000;28:391–7. Cemazar M, Miklavcic D, Sersa G. Intrinsic sensitivity of tumor cells to bleomycin as an indicator of tumor response to electrochemotherapy. Jpn J Cancer Res. 1998;89:328–33. Cemazar M, Pipan Z, Grabner S, Bukovec N, Sersa G. Cytotoxicity of different platinum (II) analogues to human tumour cell lines in vitro and murine tumour in vivo alone or combined with electroporation. Anticancer Res. 2006;26:1997–2002. Miklavcic D, Mali B, Kos B, Heller R, Sersa G. Electrochemotherapy: from the drawing board into medical practice. Biomed Eng Online. 2014;13:29. Currier MA, Adams LC, Mahller YY, Cripe TP. Widespread intratumoral virus distribution with fractionated injection enables local control of large human rhabdomyosarcoma xenografts by oncolytic herpes simplex viruses. Cancer Gene Ther. 2005;12:407–16. All authors are past or present employees of Oncosec Medical Inc. Dr. Canton, Dr. Connolly, Dr. Campbell, Dr. Bahrami, and Dr. Pierce are inventors of patents, pending and published. Correspondence to D. A. Canton.